There are many talented golfers out there. Some take lessons for years and years, others just have that natural talent. An extremely talented Jack Nicklaus got a speedy start to his golf game shooting a 51 the first time he ever played nine holes. He survived polio at 13 and the only handicap he came away with was a +3 on the golf course. At just 15, five years after picking up his first club, he shot a 66 at Scioto Country Club. A short three years later, at 18, this young man brought his natural, but now masterfully refined, ability to the PGA Tour. Nobody knew at the time that he was also bringing with him the moniker of his Upper Arlington High School mascot: The Golden Bears. After high school, he went on play at Ohio State University where he won two consecutive US Amateur titles (1959,1960) and an NCAA National Championship. He was also named World’s Top Amateur Golfer by Golf Digest for three consecutive years. In 1960, while still an amateur, he competed in the US Open at Cherry Hills Country Club (site of this year’s BMW Championship), and shot a 2-under par 282. It stands as the lowest score ever by an amateur in the US Open, but it wasn’t quite enough to win. He finished in second to some guy named Arnold Palmer. In 1962, already a world-renowned golfer, Jack Nicklaus turned pro and it only took him 17 starts to get his first professional victory. It was the US Open. This time at Oakmont Country Club and he defeated his old nemesis in a playoff. It was his first win and the first of many majors to come. So, just to emphasize: Jack Nicklaus’ first professional victory came at twenty-two-years old, at a major, and in a Sunday Playoff. Against Arnold Palmer. Simply amazing. Young Jack Nicklaus would go on to make 26 out of 26 cuts with 16 top ten finishes and be named Rookie of the Year. The legend of the Golden Bear had been born. In 1963, he won the Masters, and was, at the time, the youngest ever to do so. Twenty-three years later at 46, he would become the oldest to ever win. This brought to full circle an absolutely astonishing career that included 4 US Open victories, 6 Masters championships, 4 PGA Championships and 3 wins at The Open. He holds the record for most majors at 18. Overall, Nicklaus won 73 PGA Tour events and has a total of 118 victories worldwide. If anybody deserves to have his own tournament at his own golf club, it’s Jack. That brings us to the Memorial Tournament held annually at Muirfield Village Golf Course. The course got its name from Nicklaus’ 1966 victory at Muirfield in Scotland. 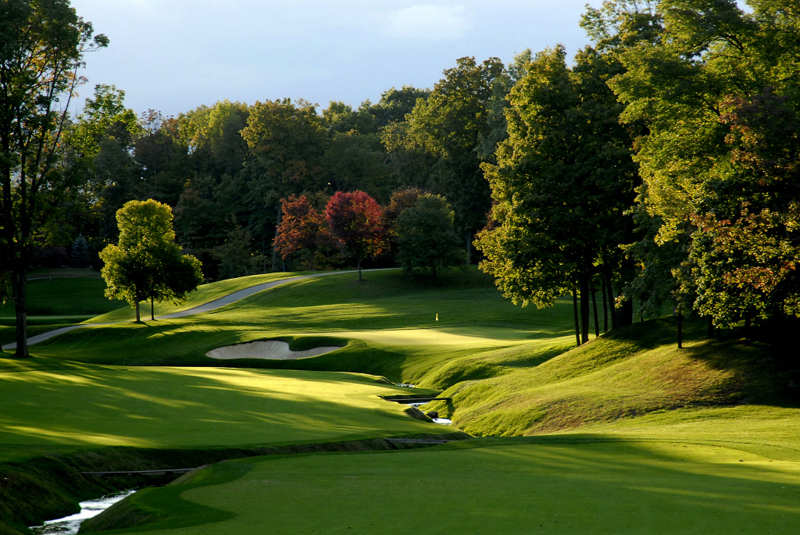 Located in Dublin, Ohio, the land for Muirfield Village was acquired the same year of his namesake victory. Construction began in 1972 and was completed two years later. The official dedication was on Memorial Day, June 27th, 1974 and featured an exhibition match between Jack and Tom Weiskopf. Nicklaus shot a 6 under 66 that very first round. His score stood as the course record for five years. The first actual event held at Muirfield Village was the Columbus Pro-Am on August 11th, 1975. Just under a year later the inaugural Memorial Tournament was held in May of 1978. The course, like the man who designed it, is one of the best in the world. It has been ranked as a Top 20 course in the United States and one of the Top 50 in the world every single year since its opening. Today, Nicklaus Designs has over 375 courses open for play in 36 countries on 6 continents and another 45 in development. Here at Lost Golf Balls we get many of our name brand, top-quality golf balls from 46 of these courses across the United States. Unfortunately, Muirfield Village is not one of them. However, we are still extremely proud to be associated, in any way, with the one and only Golden Bear. It’s never too early (or too late) to start perfecting a golf game. Stock up now with Lost Golf Balls’ incredible prices and maybe you’ll discover a natural talent you never knew you had.